I've been busy back at the painting table the last week. The Orc Boys are getting some special attention. Also, I hope to start a new theme on my blog- Miniature Monday. It goes like this- I don't like some of the things social media gives us. However, I've been enjoying the trend of #MiniatureMonday on Twitter. Its been fun seeing all of the painters out there from all the genres. So join the crowd, post a MiniatureMonday picture! (links were above, give it a go). Below is the 40 strong unit of boys just waiting to get completed. Oh, how I love the new WFB! 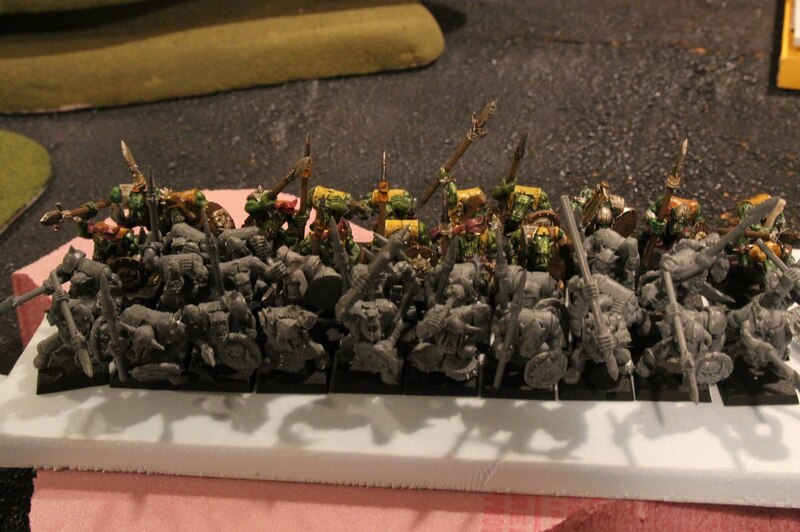 Anyway, the painting has been broken down into manageable groups of 6-8 models at a time. I like this method because it would be impossible to do them all at once (obviously). However, it is a bit frustrating to see how your painting technique and colors used subtly (and not so subtly) change over the course of a few weeks painting the same squad. I'll let you all see the subtle changes as they occur. Looking good. I'm in the grove and will be done in no time! Awesome! Glad to know you're having so much fun with these Orcs, but don't worry. Even after you finish this group of 40, there's still plenty more of them to paint. Haha... damn orcs! ;) Thanks again for doing this, I really appreciate it. 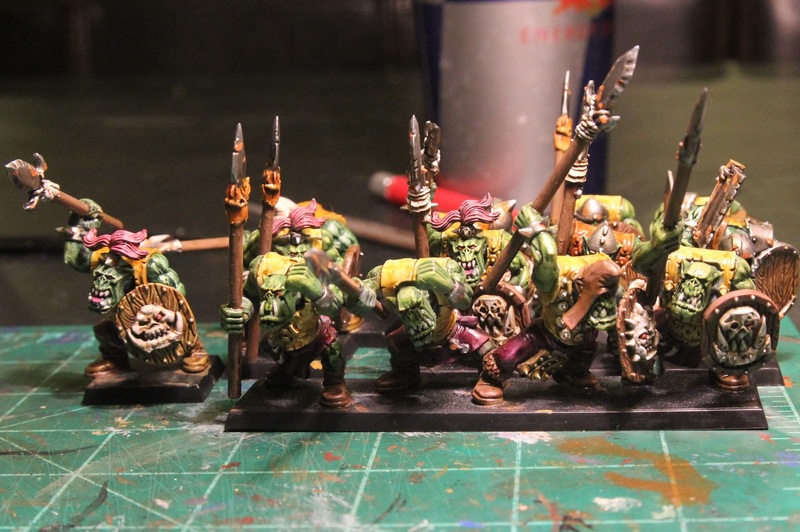 This group of Orcs looks fantastic, I love how the orange and purple elements work with the green skin tones. Also I think the subtle mix of oranges for their tunics looks really good, but definitely do whatever makes the most sense and looks best to you. If there's one shade that is easier to paint or that you just prefer, feel free to paint them as you please. I don't mind some uniformity if it helps save a little of your sanity. :) Great work, DrG!